After working with other vibratory screeners and industrial sifters manufacturers we realized it was time for a change in the screening and separation industry. Bad results and dissatisfaction from vibratory screeners and vibratory sieves operators indicated the market was eager for a new future to improve their experiences with their separation equipment and their suppliers. Some of the burdens we experienced discomforting screening machines operators were, difficult to operate and maintain sieving machines, over priced screeners and separators, old technologies, expense spare parts and a lack of support from the manufacturer. We also sadly witnessed how egos of employees of these suppliers were larger than their focus on the customers’ needs. VibraScreener is dedicated to change this pattern. With this expertise and a depth knowledge of a wide range of customers’ applications we added fundamentals values to our products and our customers’ experience. We believe that a passion for excellence and attention to details is what creates the best products. 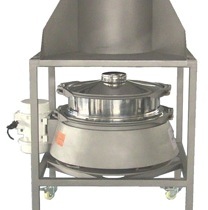 As a vibrating screen company of high quality round and rectangular screeners, vibratory sieves and gyratory sifters to improve the quality of our customers’ products, we are committed to dedicate our time and resources to truly satisfy our customers and understand their screening and separation process and their problems. We are in business to give more to our customers for their investment, while making sure they are completely satisfy with the service and products we proudly offer to our friends/clients. In addition to our innovative vibratory round screeners and rectangular separators we are devoted to understand each customer application and meet their needs by designing and manufacturing high quality and the most advanced screening and sieving machinery in the process equipment industry. Because we believe every product has a right price, we are also dedicated to develop and design cost effective technologies, eliminating unnecessary costs to ensure we deliver vibratory sieves, rectangular screeners, gyratory sifters and round separators at a fair price for the product. With this philosophy as the core of our business we are not only establishing VibraScreener as the leaders in screening and separation solutions, but as the prefer brand you trust and partner for your grading and sieving needs. To learn more how our vibratory screening equipment can improve your product quality and reputation, please contact us to start learning from one of our friendly and experienced screening and sieving specialists today. VibraScreener® foundation relies on changing the screening and separation process, to become more customer oriented by designing and developing the most cost effective advanced technologies for the benefit of our customers. Along with our revolutionary gyratory sifters and separators, our mission burns bright across the company to provide genuine reasons to be the obvious choice when selecting your vibratory sieves, industrial separators, round and rectangular screener supplier. Headquartered in Charlotte, North Carolina with a 60,000 sq/ft production facility and a worldwide range of well trained agents and reps across the globe, VibraScreener is well positioned to be the perfect partner to solve your screening and separation needs providing solutions to improve your product quality and safeguard your company reputation with the most advanced technologies in the market. If you would like to learn more how our advanced screening equipment, vibratory sieves and gyratory sifters technologies are changing industrial manufacturing, please contact us today to request more information from one of our friendly and experienced technical Engineers in your industry. Just as our core philosophy, our vision is simple and straight forward: To be and to consolidate as the most trusted brand when in need of a reliable, high performance vibratory sieve, gyratory sifter, vibrating screen, rectangular screener or round separator in the process equipment industry. To learn more about how you can benefit from our high quality vibratory screeners and industrial sifters, please contact us to speak with one of our experienced technical Engineers in your process. If you would like to learn more about our revolutionary vibrating sieves and industrial separators please contact us to be in contact. Welcome to the Future with us!